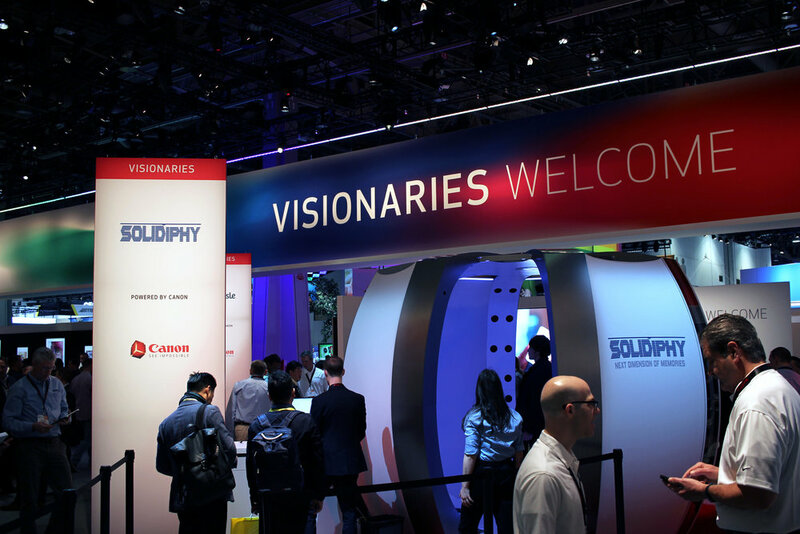 At CES in 2017, Canon declared Visionaries Welcome, and gave a platform to four such collaborators, each employing different Canon products and technologies to realize their business ambitions. Canon sought to create a booth that invited collaborations, emphasized experiences along with products, and captured the attention of the media and newly interested consumers. Canon's products are in use by countless enterprising businesses in dynamic and interesting ways. We developed a brand new design and visitor journey approach that complimented a new messaging strapline; ‘Visionaries Welcome’. Having teased the new approach to CES in pre-show communications, the Canon team had a full schedule of new partnership meetings before they traveled to the show. The booth was well-attended throughout the entire run of CES, with long lines of interested attendees eager to interact with Canon technology and engage with the four showcase Visionaries. The vibrant spectrum graphics applied throughout the experience marked a departure from the cinematic and product-focused approach Canon had brought to CES previously, but maintained a visual association to historical Canon experiences. Drawing inspiration from the global launch of Cinema EOS, and leveraging the essence of Canon imaging, the creative approach allowed this new approach to soar above their neighboring stands and competitors. The visitor journey was designed to help Canon attract future-thinkers to learn about a broader vision of what is possible with Canon innovations. The boundary of the booth featured key technologies of the complete Canon portfolio, while Canon hosted four new-to-market companies exhibiting their new products, inventively integrated with Canon technologies.